NDNA supports nurseries to develop their quality of care, to stay up to date with the latest childcare information and to run a healthy, sustainable nursery business. The Forest School Association is the professional body and UK wide voice for Forest School, promoting best practice, cohesion and ‘quality Forest School for all’. We are proud to be a Forest School Nursery. We are registered with the Office for Standards in Education (OFSTED) which regulates childcare in the United Kingdom. 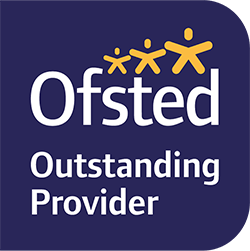 Ofsted carry out periodic inspections of nursery schools to check on the quality of childcare and education being delivered. We are registered with the PSLA which supports settings through visits to assist the nurseries to meet the welfare requirements of the curriculum. Ofsted only require one member of staff to be first aid trained within the nursery at any given time. For us we strongly believe that every individual should be trained to support and respond to an accident or injury. We are a breastfeeding friendly nursery and were thrilled to have this recognised as we were awarded for our efforts in supporting breastfeeding mothers. Here at The Old Forge Day Nursery, we love to talk! We are active participants in the Every Child a Talker language programme. We are also active participants in the Every Child a Mover programme. Each year we participate in the Barnardo’s Big Toddle always with a different theme. The Barnardo’s Big Toddle is the UK’s biggest charity event for children aged 0 – 5. All the money raised by children taking part in Barnardo’s Big Toddle goes directly to Barnardo’s work with vulnerable under 5s in the UK. Our children are passionate recyclers & love nothing better than an afternoon caring for their garden. We are currently working towards this accreditation.